Ongoing efforts to increase tree canopy, provide shade, improve aesthetics and comfort, and reduce the heat island effect along Hiawatha Ave continued with the recent planting of 130 trees from the county’s gravel-bed nursery. 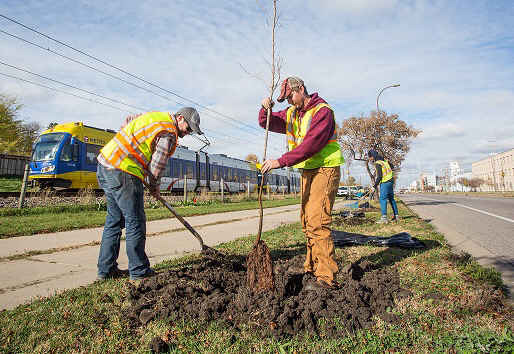 The trees were planted on the west side of the road between 32nd and 46th streets by Sentencing to Service crews and staff from Hennepin County, the Minneapolis Park and Recreation Board, and the nonprofit Tree Trust. 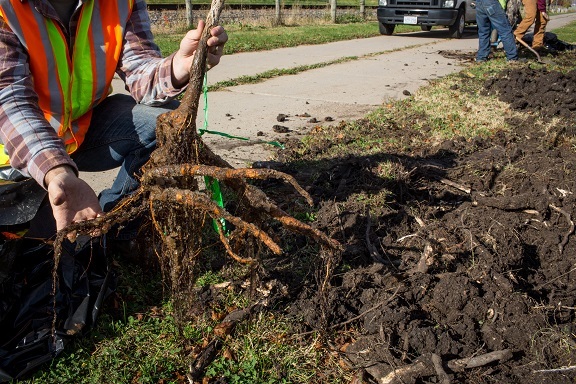 Although the trees from the gravel-bed nursery may look small, the robust root structure they developed in the gravel bed throughout the summer increases their chances of thriving in their transplanted location. The new trees include Kentucky Coffeetree, American Elm, Frontyard Linden, and Amur Maackia and will add to the diversity of species already in the corridor. This new installation adds to the 350 trees planted in the corridor in spring 2014, as part of a partnership between Hennepin County and the Minnesota Department of Transportation. The county continues to look at opportunities to green this corridor in coming years. Both the Hiawatha intersection improvement project and the landscape restoration project are essentially complete. All 350 trees have been installed in the corridor. Construction on the intersections — including the bump-outs, medians, and crosswalks — has been completed. The bike lanes and symbols along 32nd have been installed. The City of Minneapolis will be installing the pedestrian push buttons at 42nd and 46th streets by the end of September. The southside crosswalk of 46th Street will remain closed until the push buttons and walk signals can be installed. Our project landscapers will continue to water and maintain the trees along Hiawatha until the summer of 2016. Trees are covered by a 2-year warranty. Any trees that did not survive the initial transplant are planned for replacement in September 2014. Update 06.13: Expect Hiawatha to be reduced to one lane Tuesday and Wednesday next week for median tree planting. Project work along Hiawatha Avenue will be continuing for the next few weeks and should be completed by Independence Day. 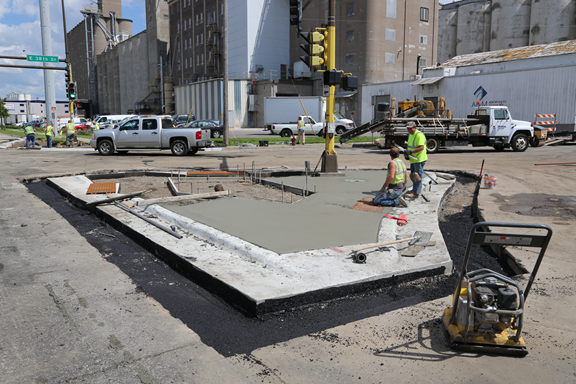 Hiawatha Intersection Improvements: A few final areas of concrete need to be poured. APS signals still need to be installed at the intersections. Striping of the crosswalks and bike lanes along 32nd Street will start next week. Hiawatha Avenue Landscaping: Around 165 trees and stumps have been removed from the corridor. Tree planting will begin later this week in the boulevards. Median tree planting is planned for next week and will require Hiawatha Ave to be reduced to one lane of traffic [lane closures are limited to off-peak hours]. 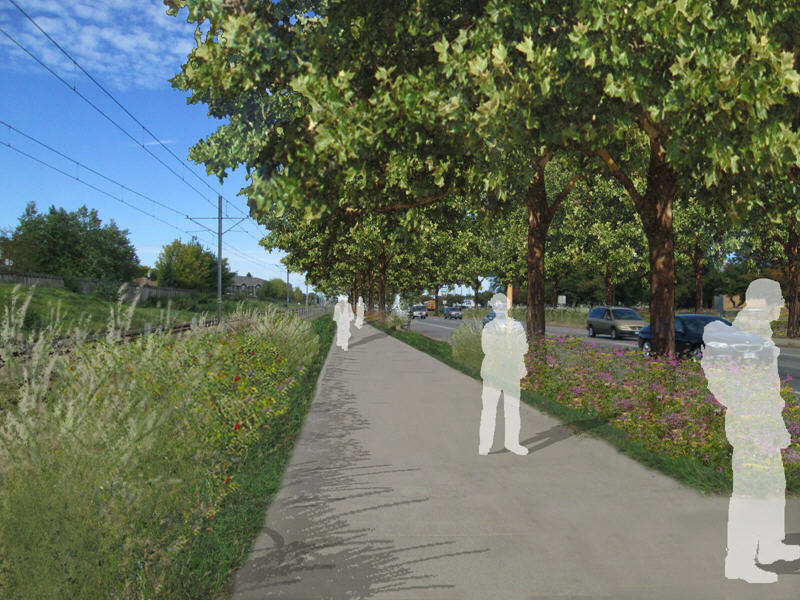 Thanks for your patience as we work toward a more pedestrian, bike, transit, and vehicle-friendly Hiawatha Avenue. 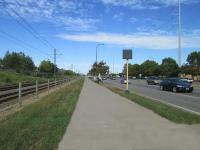 Construction is beginning on a project to improve the landscaping along Hiawatha Avenue. Starting this week, our contractors will begin removing approximately 165 trees along Hiawatha Avenue from 32nd to 46th streets. Expect some temporary lane closures as the contractors work in the medians on removals and restoration. The removed trees will be chipped and dropped off at the Park Board’s neighborhood wood chip site at 29th Street East and 18th Ave South. These trees will not only improve the aesthics of the corridor, but also help improve air quality and create a better environment for pedestrians and bikers in the area. More information is available on the project webpage.